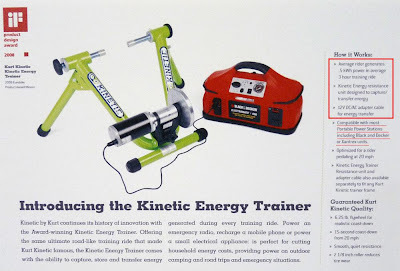 Readers may recall, through a post of mine [Kurt Kinetic Releasing 911 Trainer], that I had shared a tip-off from the Minneapolis St. Paul Business Journal that Kurt is coming out with an energy storing trainer system. Details were vague as Kurt, I believe, didn't have anything official even on their website. After some hunting through several Interbike stories, separating the junk from sensible, I found this via Tyler's Bike Rumor. This is somewhat catching up with me, since the idea seems to be around storing power for powering small appliances and for emergency purposes (see where the '911' comes from?) like you find in a typical camping trip. But the green paint seems a little obnoxious to me, especially after my line of thinking that there appears to be a solid conspiracy in the bicycle industry to make everything look like frogs [Read Invasion Of the Frogs : Rrrriibike]. Note that they have given an average figure of .5kwh for a 3 hour ride, which implies that the potential is more. It seems that in tests (as referenced in my past post), they found that 2 hours of constant riding generated 1000 watts of power, which equals 2 kilowatt-hour. The claims from Kurt were that this is sufficient to power an average home for half a day, which sounded like an exaggeration (especially if we're talking about American homes). Nevertheless, I'm sure one can sit down and do some number crunching to determine at what point in the future he/she can receive a possible return on their investment. Right now, the complete unit's MSRP is placed at approx. 500 dollars. The average household uses ~1MW-h per month or ~30kW-h per day. I have a Powertap. When I ride my trainer and walk back into the house full of lights and appliances all humming like a chorus of angels, I think of how all my effort could barely run the big light fixture over the kitchen table, and well, I want to give my local coal fired power plant a big ol hug. When you actually attempt to generate your own power from some human powered gizmo, you appreciate that a regular joe in our society has access to more ready power than a Roman emperor. Agree. I'm not so sure I want to spend 500 dollars to buy a unit to charge my cell phone. I guess I'm not that desperate to save energy. There could be others who'll differ. Now this is both impressive and useful. But it may be impractical at times. I hope those paramedics in some International Air Ambulance Service has one of these things.